Ogami Itto, the Shogun's official executioner is framed by a rival clan! His wife murdered, and vowing revenge, he flees with his infant son, Diagoro, in tow to become the most feared assassins in the land: Lone Wolf and Cub! I already shared my thoughts on each film in general discussion, but I've edited my thoughts into slightly more coherent form for this overview the entire original series of movies. Tamisanburo Wakayama certainly doesn't look like the muscular, ruggedly handsome Itto of the comic. He's a bit chubby and looks like he's made of lumps... but playing a badass sword-fighter is more than looks: he really gets the character and is great with the fights (being an actual martial artist helps). This film, though highly enjoyable, is flawed structurally. It has a frame story about Itto and Diagoro on one of their regular assassination missions interspersed with flashbacks detailing how Itto was betrayed and had his first clash with the Yagyu clan. The problem is the flashback material is much stronger and it ends with 25 minutes or so left in the film, leaving us with the less interesting of the plots for the final third of the film. It would be drastically improved if the flashbacks were placed differently and we got both showdowns (in the flashback and the present) one after another at the end of the movie. Despite lacking the emotional heft of their tragic origin, this sequel is actually superior. The two straightforward plots (Itto and Daigoro on an assassination mission while Yagyu agents pursue them) weave together better, making for a great, driving sequence of escalating showdowns. The emotional core of the film is supplied by an expanded part for Diagoro. We see much more of the bizarre yet touching father/son relationship, and in a scene where his father is injured Diagoro steps up and it's awesome. It's the most straightforward and accessible of the films. After the utter insanity of movie #2 we're back to a more plot-driven samurai actioneer. We're given some interesting views inside the values of Tokugawa era Japan, specifically the treatment of women. Some of it's disturbing (but in a thought provoking, 'get inside the mindset of the time' kinda way), but the film also meets us halfway with a crowd-pleasing sequence where Ogami Itto steps up to defend a young woman who's about to be sold into prostitution. ... but before you think Lone Wolf and Cub was going austere: the movie saves the madness for the finale, where it goes bonkers. Awesome. We previously alternated between two more dramatic installments (samurai melodrama about honor and such, long buildups to the fights, ect.) and a non-stop action installment (movie #2), but this film manages to indulge both approaches making for a satisfyingly balance. It's the movie that's got everything you want from the franchise. Nice continuity detail: when Ogami Itto has his shirt off we see the scar from when his back was slashed in the last movie. Many (most? At least that I've seen) samurai films present a worldview that's a bit more modern and humanistic, whether by having heroes we can get behind morally (like Zatoichi or The Seven Samurai) or by explicitly critiquing feudal values (like in Samurai Rebellion and Three Outlaw Samurai), but Lone Wolf and Cub really commits to the values of the time - even when it means having the hero do something we'd find abhorrent. Expect much debate if you watch this one with a friend. Again, Daigoro gets some of the best stuff. If a modern audience is looking for a moral center in the movie it's this awesome little kid, and like movie #4 it has a nice balance of action and drama. The last in the original movie series, and it's kind of a mess. The addition of a vaguely supernatural threat initially adds a real sense of tension, but it doesn't pay off. Even the fights don't seem as satisfying, though the final battle is okay. This is as good a time as any to mention that no actor playing Retsudo (the main villain) in the sequels is as good as the actor from the first film. Speaking of actors, a few faces show up several times playing different characters in these films - and to Godzilla fans they'll be awful familiar. A very satisfying series overall. Movies 2,4 and 5 are my favorites. I'm also really digging the original comic on which they are based. Dark Horse is currently re-releasing the entire series in omnibus format. The movies are pretty faithful. No surprise, considering the creator of the series wrote or at least co-wrote most of these adaptations. ^ I'm real interested in seeing at least the initial Americanized 'Shogun Assassin' movie, what with it being edited down from the first two films and containing lots of changes that sound interesting to see... the further ones are just the plain 'International dubs' (ala '70s Godzilla and all those Kung Fu movies), right? Yeah, the first one is the best by far. Just awesome. I recommend tracking it down as quickly as possible. lhb412 wrote: ^ I'm real interested in seeing at least the initial Americanized 'Shogun Assassin' movie, what with it being edited down from the first two films and containing lots of changes that sound interesting to see... the further ones are just the plain 'International dubs' (ala '70s Godzilla and all those Kung Fu movies), right? Patrick Frater wrote: Iconic Japanese comic book property “Lone Wolf and Cub: Final Conflict” is to be made as a live action, English language movie by producer Steven Paul’s SP International Pictures. The company acquired remake and sequel rights Koike Kazuo Gekiga Sonjuku, Inc., who produced the motion picture “Kozure Okami: Sono Chisaki Te Ni” in 1993. It plans a remake that will shoot from 2017. The “Lone Wolf and Cub” property first emerged in 1970 as a comic book written by Koike Kazuo and illustrated by Goseki Kojima. Their stories were subsequently adapted as six feature movies starring Tomisaburo Wakayama, four stage plays and a TV series. “Final Conflict” sees a noble samurai plotted against and framed in an assassination conspiracy the samurai disobeys his Shogun’s orders and becomes an assassin for hire. “I have been a huge fan of the property for many years and can’t tell you how excited I am to have the opportunity to embark on this journey,” Pau said in a statement. Los Angeles-based Paul has become a major axis between Hollywood and Japan. He previously produced Marvel Comic’s “Ghost Rider 1 & 2” and Namco Bandai’s “Tekken 1 & 2.” He is currently producing a live action adaptation of the manga comic “Ghost In The Shell” starring Scarlett Johansson and Takeshi Kitano. Paramount Pictures distributing the feature film worldwide. Paul’s “Ghost in the Shell” project has been criticized by some fans for racially inappropriate casting, notably with Johansson playing an originally Asian woman. Paul told Variety that “Final Conflict” will be shot with an essentially Japanese cast. Paul has recently struck production deals in both China and Thailand. His related SP Releasing is a theatrical distributor releasing up to 10 movies per year and maintains a worldwide home entertainment deal with Sony Pictures Home Entertainment. This summer SP Releasing will be theatrically distributing “Running Wild” starring Sharon Stone, and releasing ‘The Dog Lover” with James Remar, Lea Thompson, Jayson Blair, Allison Paige and directed by Alex Ranarivelo. So, set in Japan with a primarily Japanese cast but speaking English? ... okay. I could roll with that. Oh, and apparently Criterion, after knocking it out of the park with Zatoichi and Lady Snowblood, has a Lone Wolf and Cub release in the works. John Nugent wrote: Director Justin Lin is currently doing the promotional rounds for Star Trek Beyond. But when Empire chatted to him for an upcoming spoiler special podcast, we couldn’t resist asking about another project the filmmaker has bubbling away: a long-mooted adaptation of the acclaimed manga comic Lone Wolf And Cub. First published in 1970 by writer Kazuo Koike and artist Goseki Kojima, Lone Wolf And Cub is widely regarded as a classic manga, telling an epic historic tale of shogun assassins. Seven films adapting the series have already been produced in its native Japan, but nothing from Hollywood – until now. Until then, the director has to get Star Trek Beyond out the door – that’s due for a July 22 release – and he has plenty of other projects to keep him occupied, including his rumoured return to the Fast & Furious series that made his name. Plenty to keep him – ahem – Linterested. Nancy Tartaglione wrote: Quentin Tarantino took a deep dive into 1970 during a masterclass at the Lumière Festival here in Lyon this evening. The filmmaker said he’s been researching for four years that particular year and how it marked a turning point for American and international cinema. What he’s going to do with the research for now remains unclear. “Am I going to write a book? Maybe. Is it going to be a six-part podcast? Maybe. A feature documentary? Maybe. I’m figuring it out,” he said, calling it a “work in progress” before taking the packed house through what he’s discovered so far. Lyon is the first place he’s publicly testing that out, he said. Blu-Ray.com's review of the new set! Aaron Couch & Borys Kit wrote: Paramount has landed the adaptation of the seminal manga Lone Wolf and Cub, and now has Andrew Kevin Walker on board to write the script. Justin Lin, who directed several of the Fast and Furious movies, and his Perfect Storm banner are producing the project along with Marissa McMahon and Kamala Films. Joshua Long is also among the producers. Lin, who has been associated with Cub since around 2012, is also looking to direct the feature. Lone Wolf and Cub was created by writer Kazuo Koike and artist Goseki Kojima, who began publishing the manga series in Japan in 1970. The revenge story was epic in execution (it was close to 9,000 pages by the time it was done), acclaimed for its storytelling and its historical accuracy. It was influential in Japanese pop culture, spawning movies, a television series and even plays. The comics first began publishing in the US in the late 1980s. The story told of a shogun’s executioner named Itto Ogami, who starts on a path of revenge after his wife and the rest of his house is murdered, leaving only his infant son alive. Itto is joined on this quest by his son, Daigoro, who, as he grows up, is trained to be a fearsome warrior and joins him as a father-son team of assassins for hire as they travel the country and seek vengeance against the clan that killed their family. The project has been at Paramount on-and-off since 2003 and at one point even had Darren Aronofsky attached to direct. Walker rose to prominence in 1995 thanks to his script for David Fincher's acclaimed crime thriller Seven, which starred Brad Pitt and Morgan Freeman as two detectives hunting down a deranged killer who modeled his kills off of the seven deadly sins. He went on to pen scripts for 8MM as well as Tim Burton's Sleepy Hollow, which starred Johnny Depp in the retelling of the American fable. He also penned 2010's remake of The Wolfman that starred Benicio del Toro and Anthony Hopkins. Walker's 2016 animated comedy Nerdland, starring Paul Rudd and Patton Oswalt, drew upon his early days in Hollywood trying to make it as a screenwriter. He is repped by Brillstein Entertainment Partners and Ziffren Brittenham. ^Hmmmmmmmm... well, we'll wait and see. 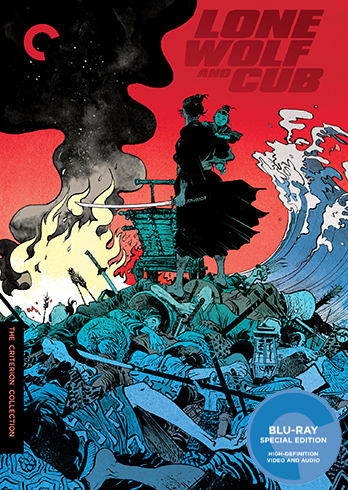 I hope for the best: Lone Wolf and Cub is awesome and it'd be great if it became a big thing with a quality movie. BTW - Criterion's set is fantastic from what I've watched so far, but I still need to watch Shogun Assassin (after October's horror marathoning is done). Finishing my Criterion set and something struck me: if they're making a new version of LW&C as a franchise they'll either have to recast Daigoro or try to do it as a trilogy or something and shoot, like, the second and third film back-to-back. Of course, if they really want to put the effort behind it at the beginning they could shoot all three at once LotR style! The six classic films were all done in like two years time and by the last one Daigoro looks too big for the baby cart! A trilogy, though, really seems ideal: with the final duel with Retsudo in the final movie.